I crossed town to the Prahran Convenience Store last week, to pick up some of the new Miyoko’s Creamery cheeses. In breaking news, these cheeses are now also available at Mad Cowgirls Vegan Grocery on my side of town. There are three currently available at both stores – although there are a tantalisingly large number of them listed on the Miyoko’s Creamery website, including a truffled one! I bought all three that were available, the Rustic Alpine, the Sundried Tomato, and the Fresh Chive. The cheeses are all soft, not slicing or melting types, and have that proper cultured flavour that I miss most about cheese. The Sundried Tomato is probably my least favourite, sundried tomatoes are a bit eighties for me. The Rustic Alpine is a slightly offputting strange brown colour, but it is nice, with a sweetish, slightly smoky flavour which went nicely with some tart apple. But the Chive is absolutely the pick of the bunch. It is TOTALLY delicious. The cheeses are not cheap at $16.50 for 185 grams, so I won’t be buying a lot, but I think the chive one is worth it. People obviously agree, because I got the last chive one while there were still piles of the other two flavours available. 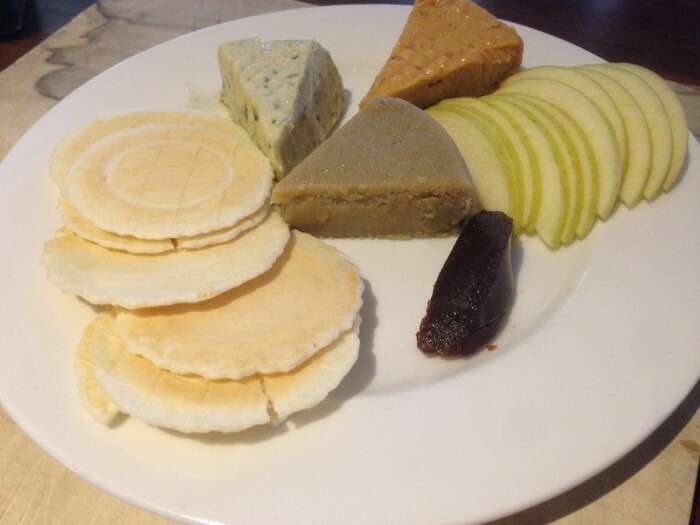 It is good time for vegan cheese lovers. The available cheeses just keep getting better. I’ve been drooling over these for what seems like ages, I might get the chives one for Christmas lunch. I did the same thing….splurged and bought all three. The guy at the counter alerted me to the arrival of the cheeses AFTER i put through my other purchases so it cost me a small fortune. Totally worth it though – best vegan cheese I’ve had! Agree – chives the best, then alpine then tomato. Wish i had some right now!